You can have the greatest product or service on the planet and a charming face, but if you’re not providing rockstar customer service, your business is going to suffer no matter how good your product is or how good looking you are (sorry! You can still probably have a lot of luck on Tinder with those looks, though!). On the flip side, if your customer service is out of this world, your clients won’t care if the other guy is doing something similar for cheaper – they want YOU, and they’ll pay a premium for it. Building your business doesn’t have to be expensive or complicated: take it from us. We built our following in a simple way: by providing customer service that blew our competition out of the water. While they were figuring out how to do less and make more, we were busy going above and beyond for our clients, and it paid off. 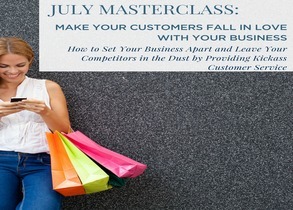 At this master class you’ll learn our top tips for providing kickass customer service to your prospects and clients. It doesn’t have to be expensive: yeah, a nice dinner goes a long way, but so do more simple and manageable tasks that will leave your customers coming back for more. You’ll walk away with actionable, affordable, and easy ways to start knocking your customers’ socks off and building up your client base.